If you head to Carriageworks this week, you’ll see that a garden-shed-sized mirror-covered box has popped up just outside the entrance. Welcome to the biggest bloody camera you’ve ever seen/been in. It’s called Double Take, and it’s a ‘camera obscura’ – a type of pinhole camera, which works on the principle that light travels in straight lines. The artist behind it is Robyn Stacey, a photographer best known for her ravishing still-life images of artfully arranged animal and plant specimens, books, objects and artefacts – but who has been working with large-scale camera obscuras since 2013, using them to transpose images of the world outside a room onto the ceilings, walls and floors within. 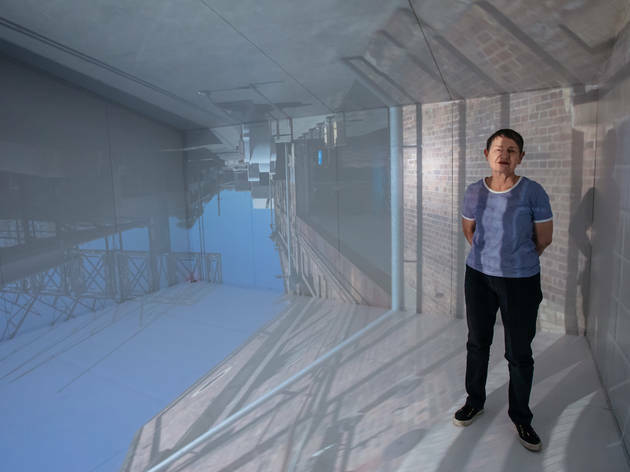 As part of Sydney Contemporary art fair, Stacey has created her first ever site-specific purpose-built camera obscura, working with fair architect Mike Stiff. Visitors can book a time slot (for free) to step inside the room and see the simple magic at work: an image of what’s outside the box superimposed onto the white-surfaced inside of the box – but inverted, and back to front. Stacey’s approach involves making a hole about the size of a 20-cent coin in the blacked-out room. Stay in the room for at least a few minutes: because the ‘cones and rods’ in your eyes that register colour rely on light to function, it takes a while for them to adjust the the darkness of the box. The earliest examples of the camera obscura (Latin for ‘dark room’) date back to the 5th century BCE, and artists including Canaletto, Vermeer and Caravaggio used them in the creation of paintings. 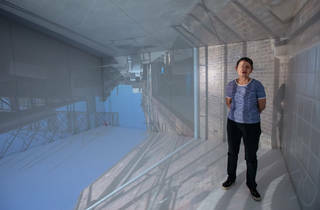 Stacey created her first room-sized camera obscura in 2013, when she was invited to be a resident artist at Melbourne’s Sofitel on Collins Hotel: “By turning the room itself into a camera obscura, the outside world is projected into the room upside down and in reverse – creating another dimension or dreamscape within the generic reality of the hotel room,” she says. As someone who works with photography, this kind of installation has a unique appeal for Stacey: rather than capturing a single moment, this piece represents an entirely transitory, ephemeral experience; no two moments are the same. Book a time slot in advance if you want to see Double Take (for free) at Carriageworks – and find out more about Sydney Contemporary (Sep 7-10). Check out our hit list of exhibitions to see this month in Sydney.